Where is European Test Services (ETS) BV located? Keplerlaan 1, 2201AZ Noordwijk, The Netherlands. How do I get access to your site? Before your arrival, you should announce names, arrival dates and departure dates of all visitors to your ETS contact. At arrival, you can park your car at the ESTEC gatehouse and get your personal badge. Afterwards you can take your car on the site to the test centre’s closest parking location. To get a badge and enter the ESTEC site you must show a valid ID card or passport! During which times and which days do I get access to your site? The gatehouse is opened during normal working hours (Mon-Fri, 8:30-17:15). You can get your badge during that time. Then, depending on your activities, ETS can arrange site access as required up to a 24/7. Thus, you can enter the site outside ETS working hours to perform your activities. Which hotels are you recommending for our overnight stay? We recommend hotels close to ETS/ESTEC in the village of Noordwijk. When ordering via the ESTEC Travel Office (ATPI Travel), ESTEC.Traveloffice@esa.int hotel discounts are granted for the hotels in and around Noordwijk. Where to should I send my equipment for testing? Please indicate your ETS contact, project name on the waybill and announce your shipment to ETS five working days in advance for large or special shipments. What should I do when I send my equipment from a non EU country? ETS is not exempted from import tax and thus we advise you to send your equipment via CARNET. ETS never accepts customer equipment when to be imported permanently. Note: Equipment for ESA projects only can be imported freely, the sender shall send invoice and packing list to the ESA technical responsible first and wait for approval (the goods shall thus not be sent to ETS but to ESA for tax exemption). How do you perform truck off-/loading? There are several ways for truck off-/loading: By 3tons fork lift truck, by 16tons overhead crane in the loading bay or by specially rented external crane or large fork lift truck. In all cases the truck off-/loading is performed by external supplier, the external crane and large fork lift truck are charged extra if not offered in our proposal. All ESA waivers and the insurance form must be sent to ETS before arrival of the truck, without those documents dully signed, there will be no unloading. Do I have to pack my equipment for return transport? Yes, ETS personnel is not packing your equipment for return transport. After you have packed it, ETS personnel can manage the truck loading but packing has to be done by the customer. Who is cleaning my containers and auxiliary test fixtures with what cleansing agent? ETS contractors clean containers and auxiliary test fixtures (if dirty) before entering the test centre. Following cleansing agents and methods are available: HP water spray, pressurised air, water & soap, damp cloth, dry cloth, etc. During which hours do you perform truck off-/loading and containers cleaning? Truck off-/loading is performed from Monday to Friday between 8:30 and 16:00. The cleaning personnel is available for cleaning from Monday to Friday between 7:00 and 15:00. In case you plan your transport arrival differently, please request your ETS contact to arrange support personnel. Does ETS personnel handle my equipment? ETS personnel is instructed not to touch customer hardware and instead to give support to the customer during handling. Instructions for test centre handling equipment is given to customers before use. Based on the indicated value of the equipment exceptions can be granted by the ETS managing director. Which certifications do we need for our non-test equipment on your site? Who is my contact within ETS? Your first contact within ETS is the ETS Commercial & Project manager. With him, you can check the feasibility of your requirements, get a proposal and reserve a provisional test slot. As soon as a contract is signed, a Test Programme Manager will be designated within ETS who will be your focal point for the test campaign. 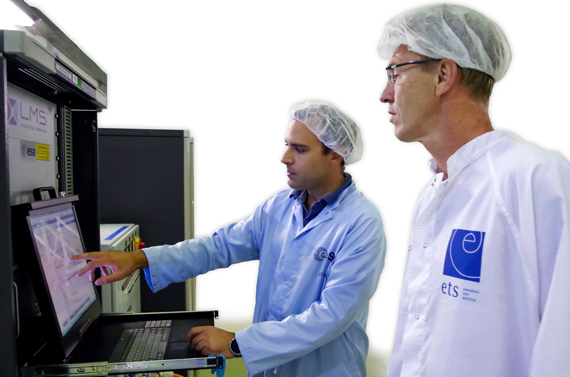 The ETS Test Programme Manager will be at your disposal to ensure an efficient and successful test campaign at ETS. Do I need to fill in any forms or templates before arrival? Insurance form, Waiver of liability vis a vis ESA, Waiver of recourse for handling and storage at ESTEC. This form is used to assess safety constraints related to your product or test. The questionnaire shall be provided to ETS two months in advance of your spacecraft arrival or two weeks before your equipment arrival. You shall fill in ETS data handling forms for the right configuration of our data acquisition equipment. The forms shall be provided to ETS four weeks in advance for mechanical testing, six weeks in advance for thermal testing; submittal shorter than four or six weeks may lead to delays. If you require any special network connections for your onsite office you shall fill in the ETS network interface form for the right configuration of data connections inside the test centre. The form shall be provided to ETS six weeks in advance of your arrival; submittal shorter than six weeks may lead to delays in the data connection provision. Special connection is to be understood as “anything else than WiFi network”. What inputs do you require before testing? Specific inputs required by ETS are indicated in the work package description of the ETS proposal. Furthermore we need to receive certain forms to be filled in (see question about forms). Besides from the forms the most common required inputs are: Test specification, test procedure, instrumentation plan (in case ETS shall install sensors), schedule updates. Do we need to bring a special fixture/adapter to mount the test article on your facility? When receiving a facility (service), your test article will not fit directly on the offered facility: The facility is offered basically with the accompanied interface drawings depicted in the detailed facility description. Thus a dedicated fixture/adapter is required to mount your test article onto the facility: In general the fixtures/adapters are provided by our customers, if specially requested and confirmed by an offer the fixture/adapter can be provided by ETS. Do you provide bolts for test fixture/adapter installation on your facility? For mechanical testing we have available a stock of bolts for all our facilities, nevertheless the customer is responsible to assure that the right bolts are available with the right length/material/strength before coming to ETS. For thermal vacuum testing you shall always bring your own bolts. We have a general toolbox available at every facility but the customer is responsible to assure that the right tools are available before coming to ETS. Is it allowed that our equipment may enter your clean rooms? In case you have a doubt that your equipment is not clean enough for entering the clean rooms please inform ETS. We make sure that your equipment will be cleaned before entering the centre, contamination hazards will be covered by foil. In general equipment covered with rust, grease or wood is not accepted to enter the test area unless provisions for covering these parts (foil/paint) are discussed and accepted. Do we have to be present at your site during the test? We require the presence of at least one customer representative for operating and handling the customer equipment. What test standards can you comply to? We have experience with a wide range of test standards like: ECSS, MIL-STD-810, MIL-STD-461, MIL-STD-167, RTCA DO-160, IEC 61373, IEC 60068, EN 50121, ASTM D 4169 and more. If you are interested in our compliance to other standards please submit your standard to us and we will check our compliance. Do you provide a test report and in which timeframe? Normally ETS provides a facility data report after performing tests. The provision of the report is indicated in the ETS proposal, preliminary test data is already provided at the end of the test. Facility Data report delivery time is maximum 4 weeks after test. In case you wish to receive the data report sooner please refer to your test contact. If requested and included in our proposal: Yes. Offices are equipped with desks, chairs, cupboards, phones and DSL connection on request. Do you provide preparation or storage area? Yes inside the test centre there are several preparation halls available, storage area is available on the same site and should be arranged with the ETS test program manager. Do you provide ICT services? Yes we provide phones and data connections for your computer network and your computers. In general WLAN and phones are available to all customers, special network and DSL connections (request time of at least 6 weeks) are charged extra if not included in our proposal. No hardware (e.g. PC, printer, scanner …) is provided. Is there a restaurant or cantina available on your site? Yes you can use the ESTEC restaurant for your lunch.